Genuine science examines the unexplained. Its fraudulent impersonation "explains" the unexamined. On 14 April 2009 Dirk Morgan, who lives along the Little Miami River about a mile south of the Fort Ancient earthworks in Warren County, Ohio, unearthed this sandstone boulder on his property, originally intending to place it in his wife Lori’s rock garden. Upon close inspection, he quickly changed his mind. The object measures 27” long, 18” high, and 10” wide. It was roughly 75% buried, and inverted from the position in which it is shown above. Its exposed surface gave the appearance of being nothing more than a rounded rock typical of glacial erratics left in that area by the Illinoian ice sheet. Having pried the stone from the ground and removed the soil within its V-shaped cavity, Mr. Morgan rotated it to a position in which it sat firmly upright, whereupon he was startled to see a huge grinning head like that of a snapping turtle - and with eyes in the right places on each side, one of them with a round centered iris. Realizing that he might have uncovered an artifact of considerable age, given its depth of deposition and proximity to the Ft. Ancient earthworks, Mr. Morgan showed his find to the manager of that site, who immediately recognized its possible importance and contacted professional archaeologists in Columbus. Mr. Morgan then e-mailed them photos of the object. They recognized its resemblance to the head of a snapping turtle, but doubted that it was of human workmanship because the eyes were of slightly different sizes and not in precisely the same location on each side, the head was proportionally narrower than that of a real-life snapping turtle, and the apparent carving was too crude. Mr. Morgan persisted, so a week later a local museum’s curator of archaeology was sent to inspect it. The curator looked it over for about three minutes, then declared it to be nothing more than a product of natural erosion. Mr. Morgan offered to transport the stone to Columbus for an in-person assessment by the archaeologists there, but received this reply: “I see no reason at this time to pursue further investigations of your enigmatic stone object”. This was to have been the final judgment, but in the meantime photos of the object had appeared in the on-line edition of the Cincinnati Enquirer, and a link to these had been posted in an archaeology forum on the Internet. Alan Day, an avocational archaeologist with some academic training and fieldwork experience, brought these to the attention of Prof. Eric Law at Muskingum University in Ohio, a specialist in petrology, the branch of geology that deals with the origin, composition, structure, and alteration of rocks. Dr. Law observed that the appearance of the stone as seen in the photos and some better ones that had been taken suggested at least an 85% probability of artificial modification, natural erosion into the current form seeming somewhat difficult. In May 2009 the stone was transported to Muskingum University’s geology laboratory. After an almost two-hour examination, Prof. Law concluded that in addition to compelling but not entirely conclusive circumstantial physical evidence, distinct tool marks at the back of the figure’s mouth, perpendicular to the crevice, give clear indication of artificial modification. Major arguments for human modification of this rock include: 1. Except for the bedding surface that defines the width of the head, straight faces are not conformable either with rock bedding or with rock joints. 2. Angles between straight faces are either too wide or too narrow, not being characteristic of natural fractures. 3.The wedge-shaped indentation within the left eye (appearance of an iris) is petrologically unexplainable other than by an unlikely natural impact mechanism. 4. The most convincing evidence is the mouth. The presence of a rock inclusion of any type is unlikely. There is no petrological/geological reason for the presence of this large wedge-shaped recess. The innermost part of the mouth, the throat, is a cave-like indentation with parallel upper and lower planes. There is no natural process that can produce this kind of erosion. Further, highly probable tool marks are observable and well preserved. Cutting the rectangular notch at the back of the mouth would probably have required a 0.5-cm-wide hafted chisel bit; for example, a piece of flint. There is, unfortunately, no material within the rock that can provide for a determination of the time of human modification. Judging from the location of the find site and circumstantial contextual evidence, there seems little doubt that this sandstone block is an artifact created by aboriginal inhabitants of the Fort Ancient area. In July 2009 Dr. Robert Riordan of Wright State University, an archaeologist and prominent researcher of the Hopewell, examined the Turtle Head in person and said he had no doubt that it had been human-modified. He did not venture a guess as to when it had been worked, or by whom. It seems likely that the “Turtle Head” had remained in place for quite a long time, given its size and weight, and its provenience at least fifteen feet above the flood plain. And there is no indication in property records that the immediate terrain had seen activity in historical time likely to cause major perturbation. A properly executed search for temporally diagnostic artifacts in the stratum might be helpful, but then this object could have been present in situ long before these were deposited. Altogether it is a bit of a mystery. It is interesting (maybe meaningfully, maybe not) that this stone was situated near a large and symmetrical hill (abandoned meander core) about 100’ high, shown on the topographic map below. 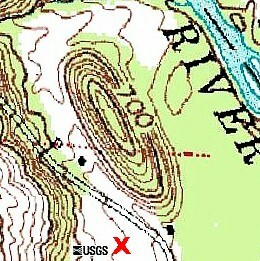 The approximate location of the “Turtle Head” is indicated by the red X. 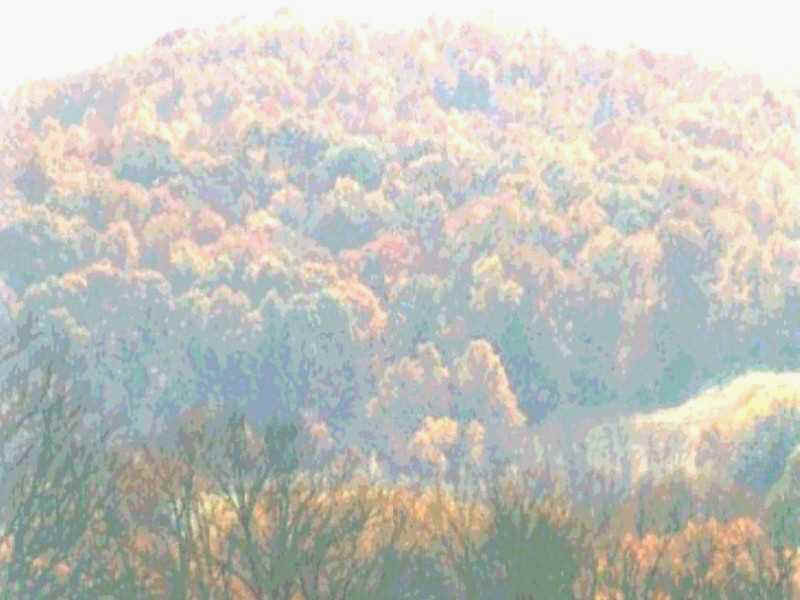 For at least a century this hill has been known locally as “The Ark” because of its resemblance to an up-side-down boat. In the context of the carved rock, it takes little imagination to see the hill’s form as that of an upright turtle carapace. (And this venue by the river is home to an abundance of turtles.) Of course this image is common in Native American tradition, and there is their well-known creation story in which the earth itself emerges on the back of a turtle. The evidence of human agency revealed by proper scientific assessment of this crude but compelling piece that was so hastily dismissed as a “geofact” seems to suggest that a common practice among professional/academic archaeologists should be reconsidered. These are often approached by avocationals and casual finders seeking an opinion on stones having the appearance of artificial modification into zoomorphic or even anthropomorphic forms, and many if not most professionals have more or less understandably come (or have been taught?) to regard this as an occupational hazard to be dealt with as expediently as possible, typically by presenting (as in the case of this find) a superficial and facile explanation in terms of natural erosion, differential weathering, etc. Usually this suffices to send the finder on his or her way. Citing “images in clouds” is usually part of the routine, conveniently ignoring a likewise real part of the human condition, “psychological set”, to which even professional archaeologists are subject; i.e., one generally sees only what one is expecting to see. And one all too often believes one really understands what people hundreds or thousands of years ago could or could not have been thinking and doing, while it is a pretty safe bet that they just did whatever they did with little consideration of what we might think about this in the twenty-first century AD. Altogether, it seems that at least the more compelling “figure stones” should, when practical, be subjected to close examination by specialists in the physical properties of the lithic material. Of course given the ravages of weathering, erosion, and other attrition (“taphonomy” in general), it is, in most cases, much less a matter of establishing the certainty of artificiality than of trying to assess a level of probability. In the past few years it has been these authors’ experience that several such suspected artifacts that have been dismissed as geofacts, not fitting accepted “Indian” artifact paradigms, have, upon close (often microscopic) inspection, revealed a high probability of human modification (near certainty in some cases). Whether or not an object matches textbook pictures of pre-recognized artifact material, if it is human-modified it is in fact a part of the archaeological record. "Know what you see - don't just see what you know."